A simple ode to that wonderful glowing golden orb of warmth that has appeared in the sky over Edinburgh this morning. No, not a meteorite. The sun! Hello old friend, so good to see you again. We have missed you! Thank you to everyone over at 'making everyday beautiful' for helping me to celebrate such a simple pleasure. Such a perfect way to start the working week I think! What a beautiful way to start the day... thank you! The same beautiful (and rare) phenomenon has appeared here in South Finland too! It has been a while. Last week I walked by my favourite yarnshop and saw a beautiful batch of golden yellow merino wool. Could not resist and bought it for a purpose that is not yet clear to me. Thank you so much Emma for creating this beautiful board of yellow! Have a nice week! Oh Thanky thanky Miss Emma! 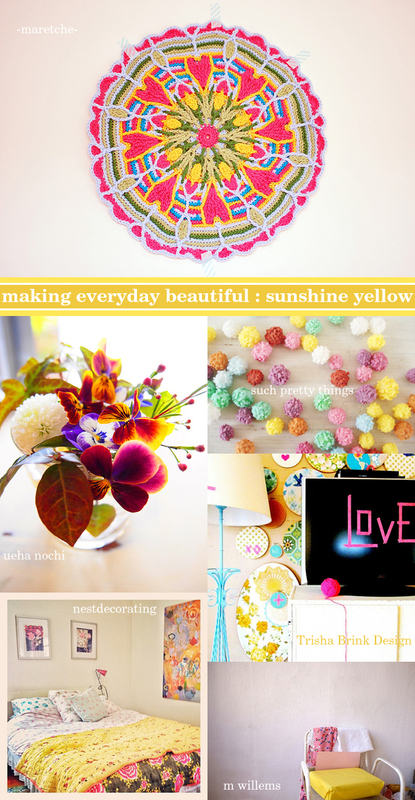 ;) Love the collection today my friend...yellow is my favorite color after all & we got a little sunshine here too! Yaya! Anyway, have a lovely week, and I hope you get many more days of sun soon! Makes me absolutely want to paint a wall yellow!